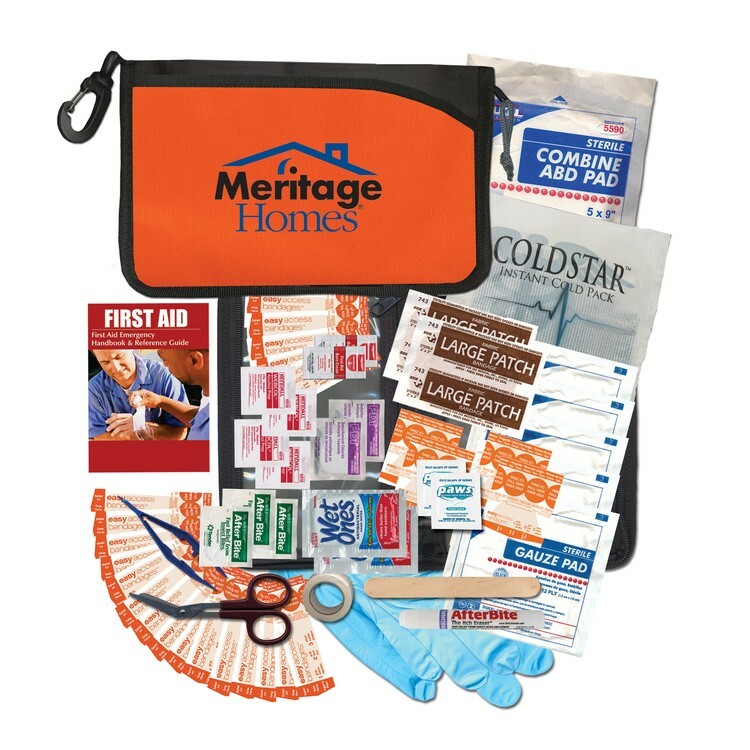 Keep this custom first aid kit on hand at sporting events so you'll be prepared for anything! Perfect for locker rooms and the sidelines! Customize each pouch with a brand name, logo, team nickname and more to let everyone know you are there to meet their needs! 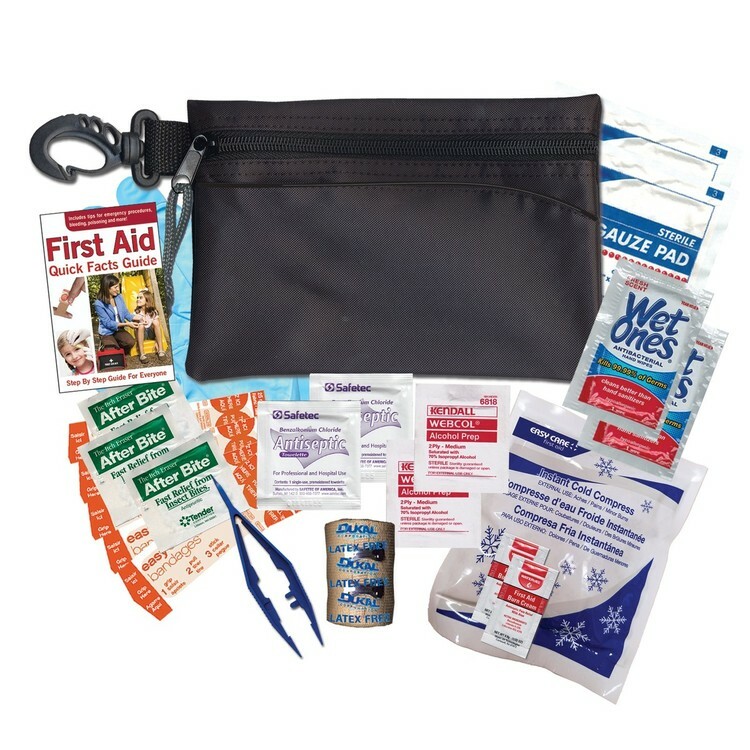 This kit includes 1 Ice Pack, 1 Elastic Bandage, 2 Gauze Pads, 1 Pair of Nitrile Gloves, 2 Wet Ones Wipes, 1 Tweezers, 2 First Aid Burn Cream Packets, 5 Bandages, 3 After Bite Sting Swabs, 1 First Aid Quick Facts Card, 2 Alcohol Wipes, and 2 Antiseptic Wipes. Had a late night on your latest business trip or convention? Tackle the night before on the day after with this hangover kit. It’s all packed into this 4.5" x 3.25" zippered nylon case with a rope loop and carabiner clip. 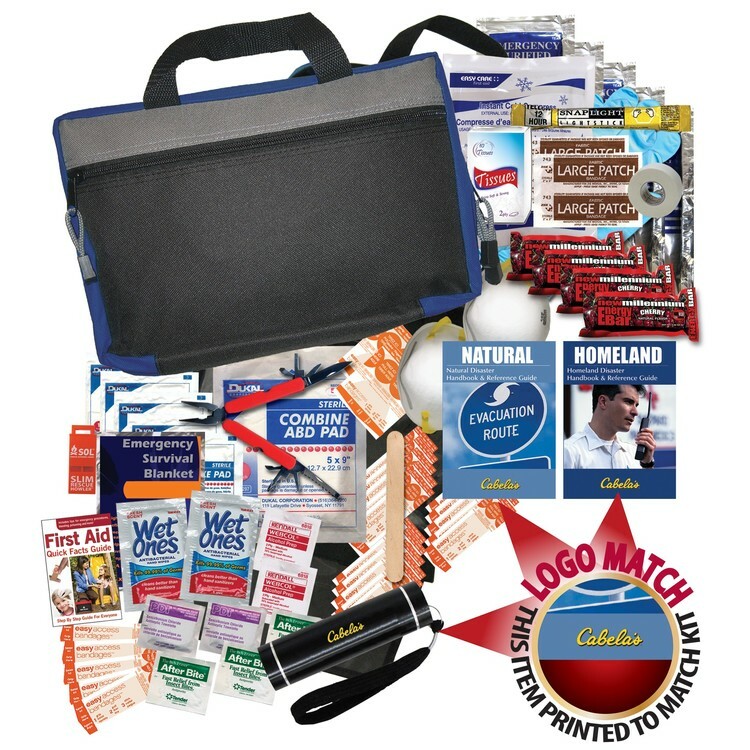 Choose from four colors for the case and add your organizational or corporate emblem to create an eye-opening branded promotion. It won’t help you memorize that sales pitch, but it’s sure to get you out of bed. 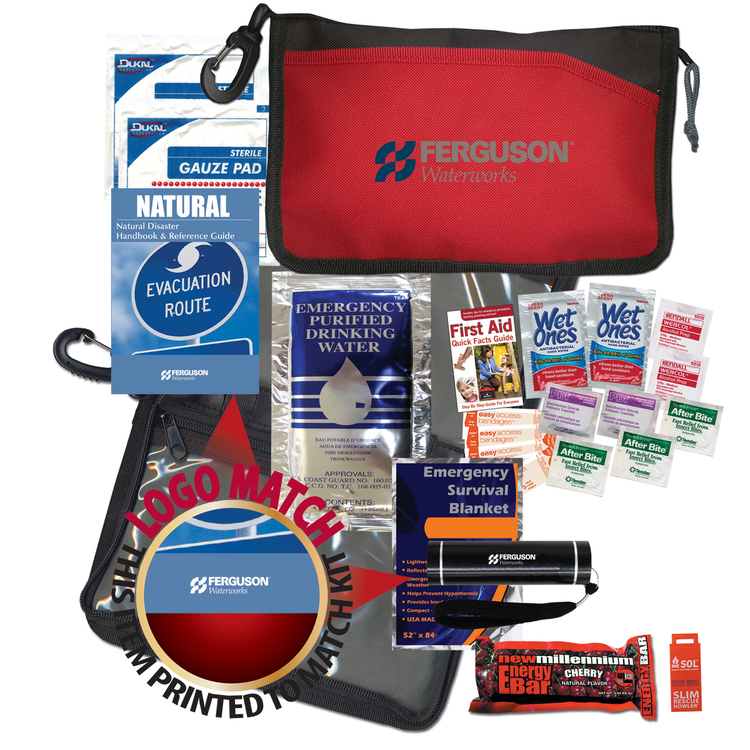 This kit makes a great giveaway for convention attendees, or to throw into an orientation kit. 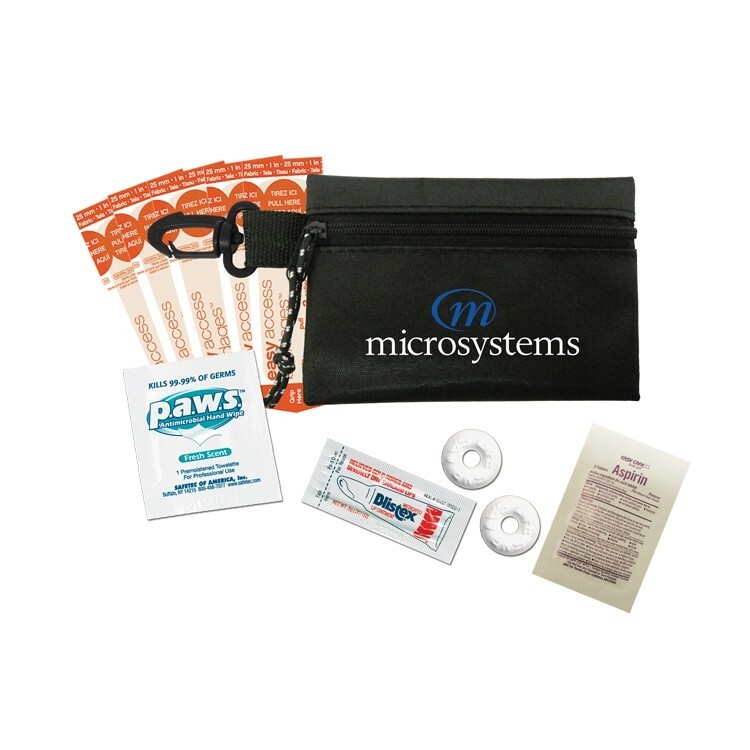 This kit includes 5 Bandages, 1 P.A.W.S Hand Wipe, 1 Blistex Packet, 2 Lifesavers Mints, 1 Aspirin Packet. Learn how to prepare in case of a blizzard, flood, earthquake, or tornado. 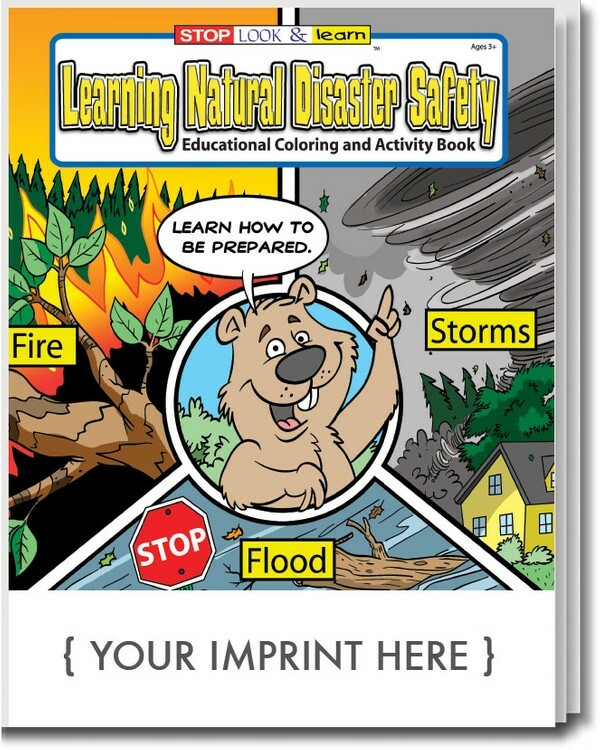 The child is the star as they receive helpful tips to keep safe during a natural disaster. 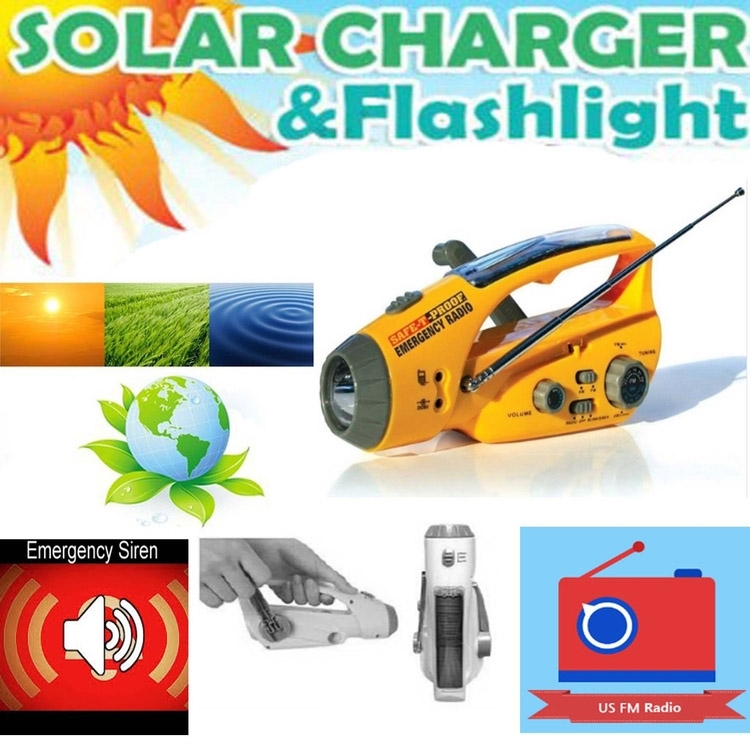 Emergency Solar Hand Crank Radio & Flashlight No need to install batteries, use solar power or hand crank to charge the built-in battery High quality motor, low noise, high conversion There is no trouble to buy replacement batteries, also not pollute the environment Phone charger kit With radio, built-in speaker, clear and loud sound Alarm function, open the alert button, flashlight will issue a warning loud and piercing voice, if you are caught in an emergency situation, this feature can help you as soon as possible to help. Keep your home and family safe & secure from natural disasters. Hurricanes, Tornadoes, Earthquakes – all can strike with a punch. Be prepared with these Key Points on what to do in the event that you find yourself living through a natural disaster. 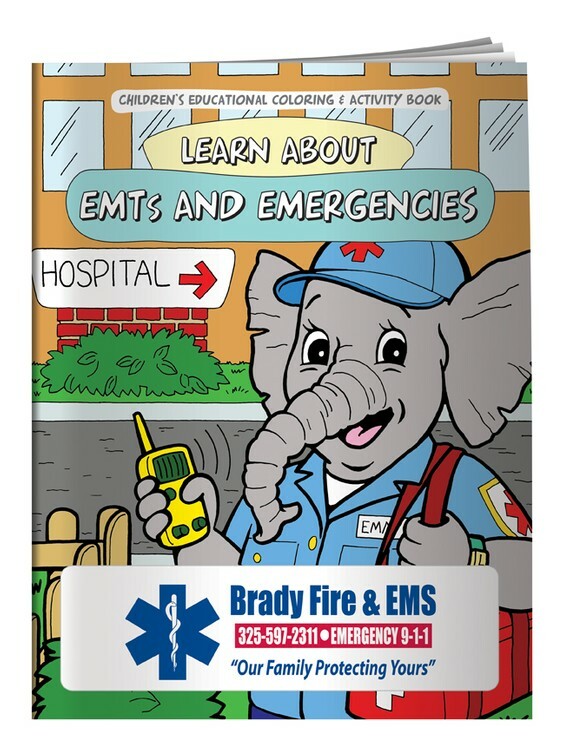 Emmie the Emergency Medical Services Elephant explains how EMS works, who's on the team and when to call for help. 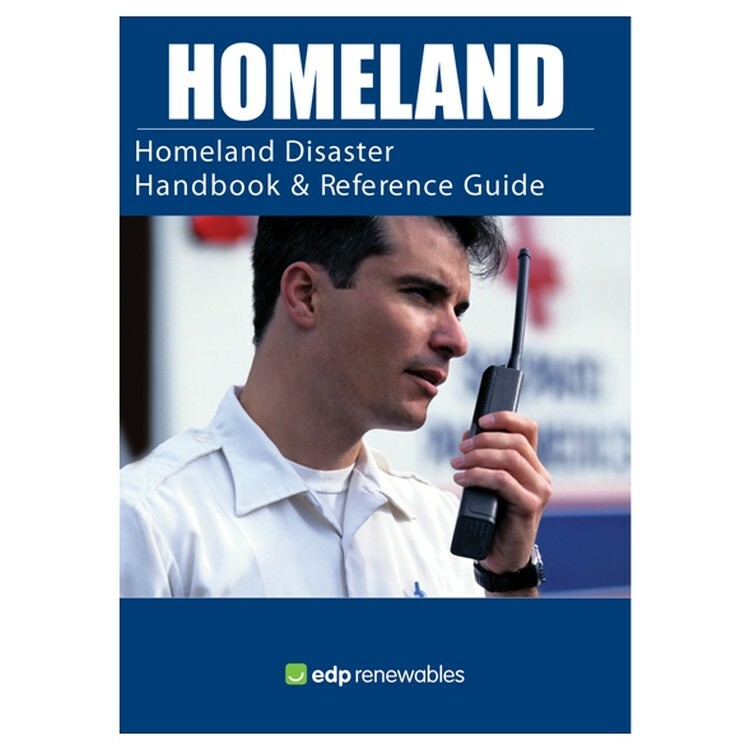 Be prepared in the event of a homeland emergency or chemical disaster with the help of this Homeland Security Guide. 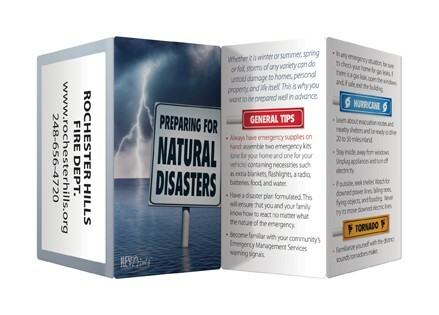 Keep this manual with any emergency supplies so you are ready for anything. 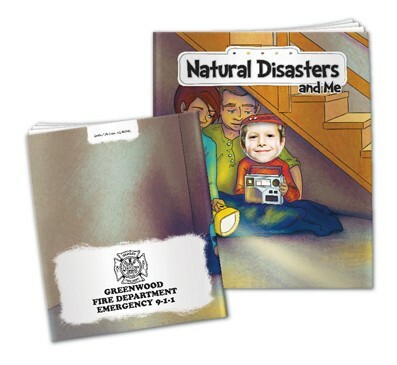 This 48 page guide gives information regarding evacuations, chemical threats, power outages and general first aid care. The manual cover can be imprinted also! This is a one of a kind item that every family or individual should have on hand. 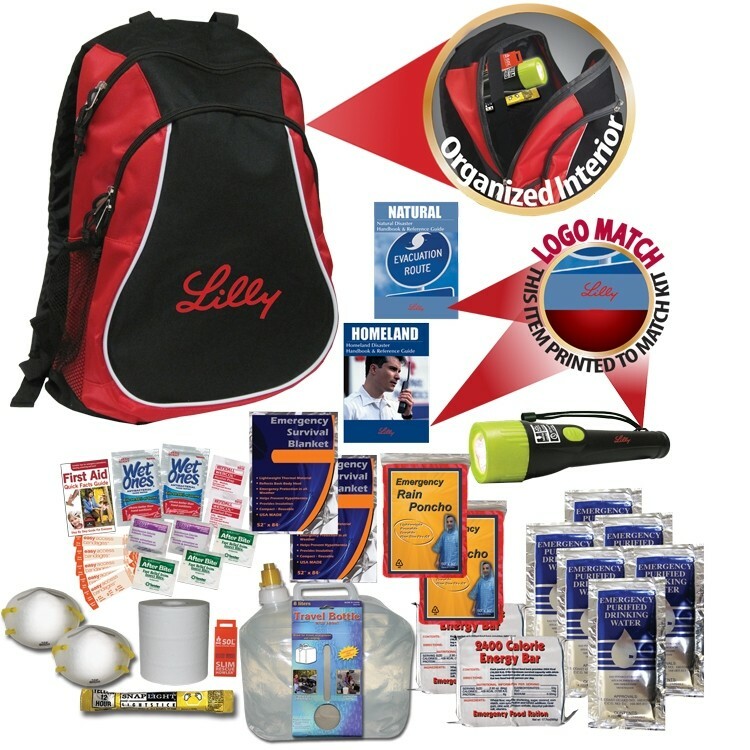 Whether a natural disaster is anticipated by days, hours, or just minutes, you can be ready to vacate your home or office in no time with this already stocked survival backpack. 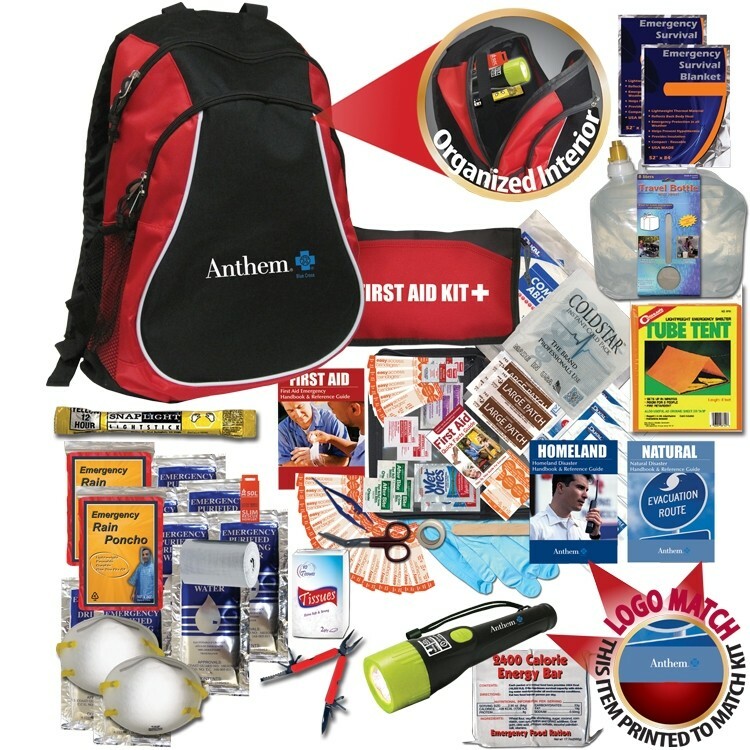 This 12” x 15” pack is made of rugged nylon and has an organized interior. 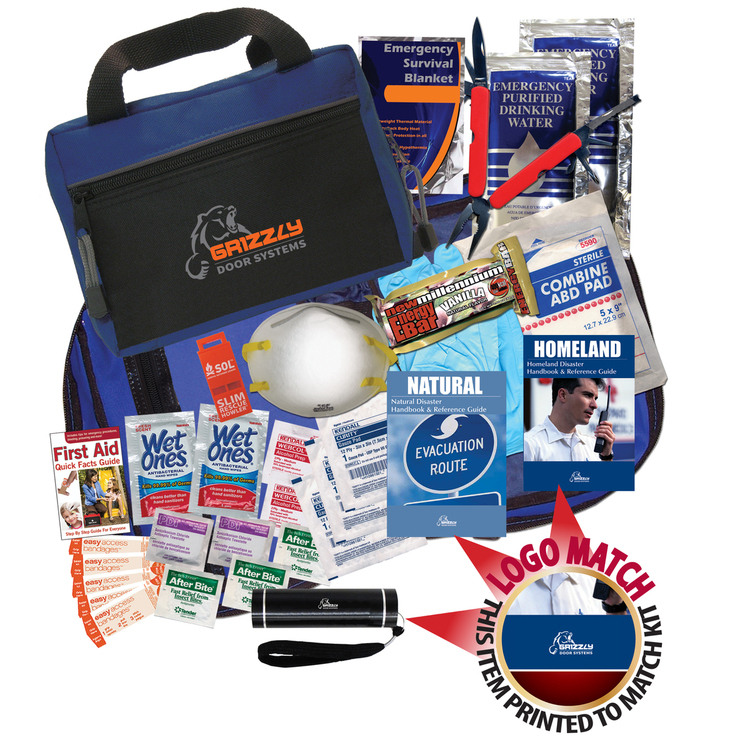 Add your organization or company emblem or message to create a one-of-a-kind branded promotion that will be the hit of a sporting goods, camping show, or survival exposition. 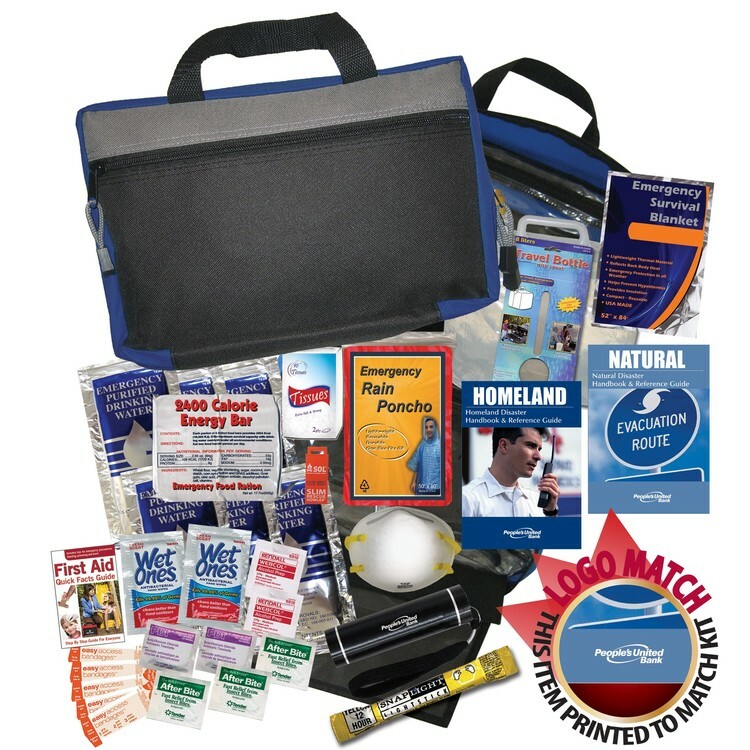 This kit includes 1 Tube Tent, 1 Roll Duct Tape 2" x 10 Yards, 1 2.5 Gallon Water Bag, 2 Emergency Blankets, 1 Multifunction Knife Tool, 1 LED Flashlight w/ Batteries & Imprint, 1 48pg Natural Disaster Guide w/ Imprint, 1 48pg Homeland Security Guide w/ Imprint, 8 Emergency Purified Water Pouches, 1 2,400 Calorie Energy Bar Pack, 1 Tissue Pack, 2 Rain Ponchos, 2 N95 Medical Grade Masks, 1 Emergency Whistle, 1 Lightstick, 1 48pg First Aid Guide, 1 Scissors, 1 Ice Pack, 2 First Aid Burn Cream, 2 Wet Ones® Wipes, 20 Bandages, 3 After Bite® Sting Swabs, 1 First Aid Quick Facts Card, 2 Alcohol Wipes, 2 Antiseptic Wipes, 1 Tweezers, 1 First Aid Quick Facts Card, 5 Gauze Pads, 1 Pair of Nitrile Gloves, 2 Knuckle/Fingertip Bandages, 1 ABD Super Absorbent Gauze Pad, 1 Finger Splint, 1 Roll Tape 1/2" x 5 Yards, and 2 Large Patch Bandages. 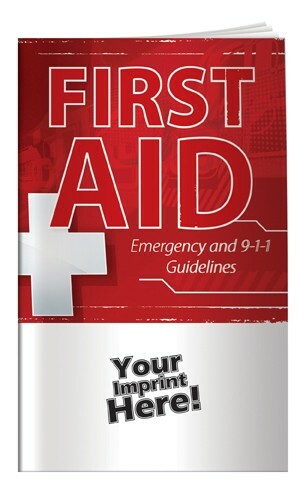 Handy, pocket sized first aid book with emergency room and 9-1-1 guidelines. 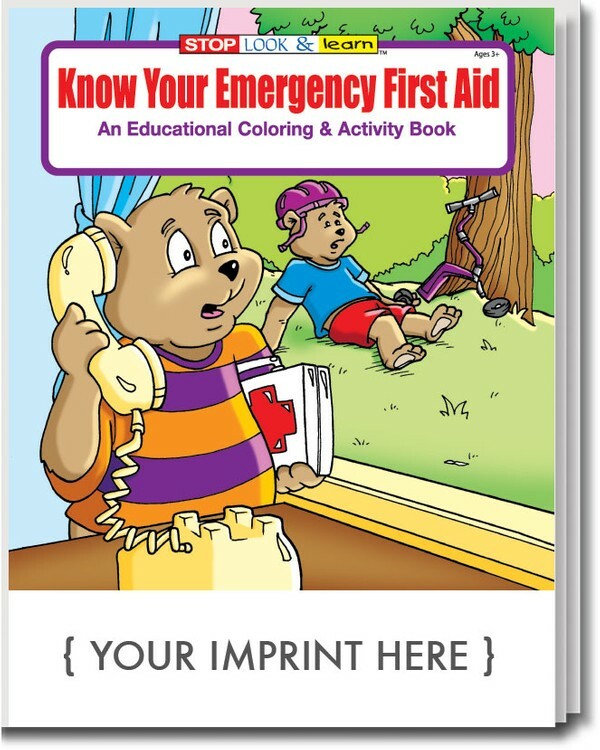 Provides basic first aid tips for bumps, bruises, bites, burns and more. All the information you'll ever need in case of an emergency. In the event of an emergency or natural disaster, you’ve got only on job – survive. This deluxe kit could be the difference. Choose from red or blue, and add your logo or emblem to several parts of this kit through our logo-match method. 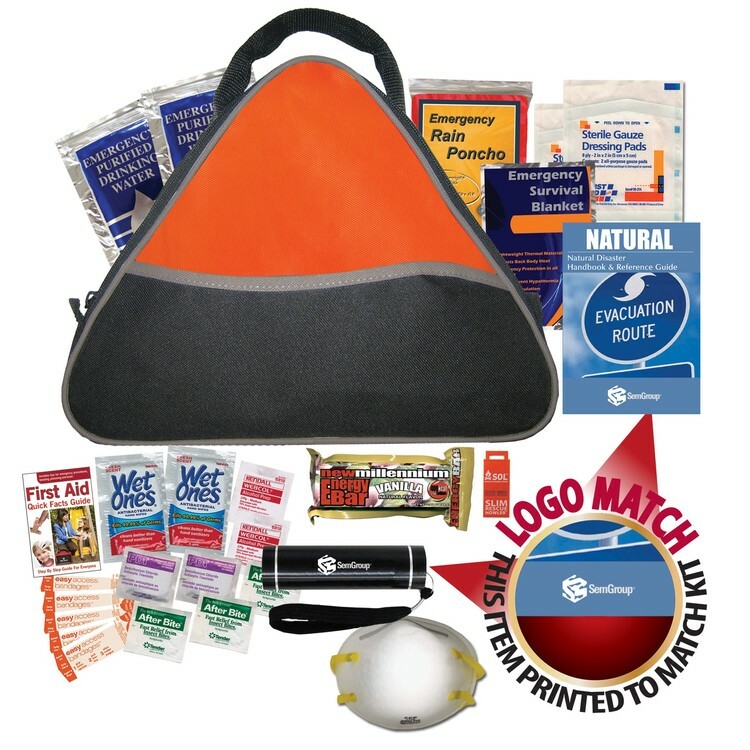 Create a branded promotion that’s a great giveaway for camping and survival shows. 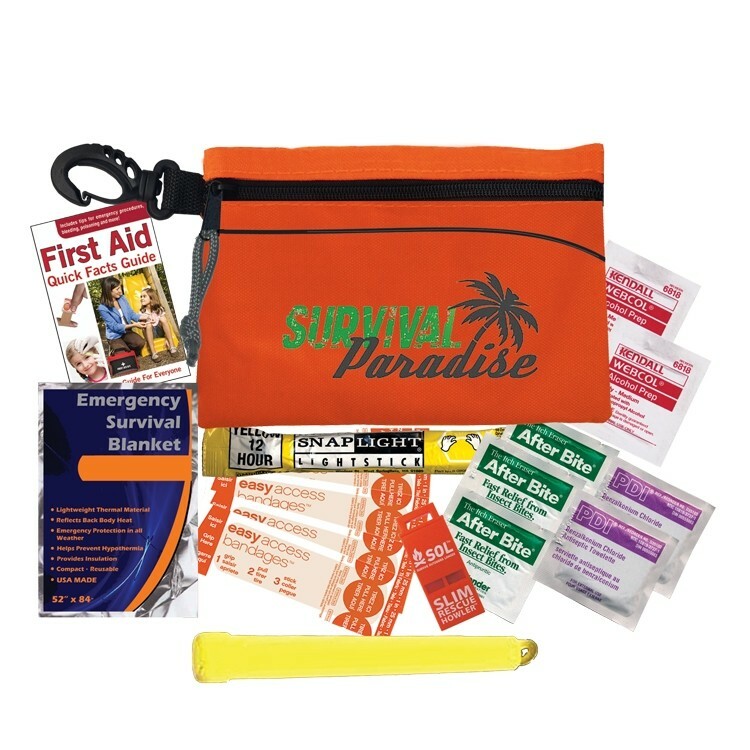 This kit includes 1 LED Flashlight w/ Batteries & Imprint, 2 Emergency Purified Water Pouches, 1 Emergency Blanket, 1 Emergency Whistle, 1 N95 Medical Grade Mask, 1 Multifunction Knife Tool, 1 400 Calorie Energy Bar, 1 48pg Natural Disaster Guide w/ Imprint, 1 48pg Homeland Security Guide w/ Imprint, 1 ABD Super Absorbent Gauze Pad, 3 Gauze Pads, 1 Pair of Nitrile Gloves, 2 Wet Ones® Wipes, 5 Bandages, 3 After Bite® Sting Swabs, 1 First Aid Quick Facts Card, 2 Alcohol Wipes, and 2 Antiseptic Wipes. Be prepared with this informative guide that discusses hurricanes, tornadoes, flash floods, winter weather and much more. 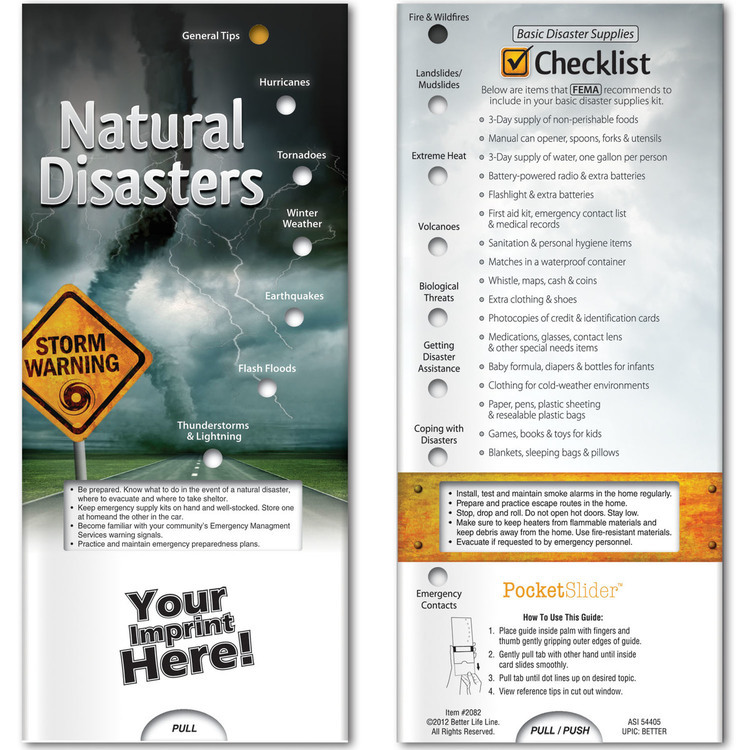 Includes a disaster supplies checklist and emergency contact info for helpful organizations.